Morenike, Duke University, took the European Security Dilemmas and Intelligence core course this past fall. She also lived in a Homestay in Täby – a suburb north of Stockholm. DIS: Hi Morenike! You live with local hosts. Can you tell us about them? Morenike L-F: My Homestay consists of my host mom Lina, her partner Lars, and her three kids. We live in Täby and I’ve had such an amazing experience with them since the first day I arrived in Sweden. DIS: What is the town of Täby like? MLF: Täby is a small suburban neighborhood in northern Stockholm. It is a nice and peaceful environment. From the outside, the houses are all a cute red color and the neighbors are so well acquainted with each other. DIS: What is a typical day like for you as a student living in a Homestay? MLF: I wake up and get ready for classes. Then, I usually grab breakfast with my host mom and siblings. During this time, we discuss our plans and the things we are looking forward to that day. Then I commute to Musikhogskolan in Ostermälm. I typically walk for 15 minutes, take the Roslagsbänan into the city, and then walk from the train station to DIS. I go to my morning class, have lunch or fika with my friends or professors, and then go to my afternoon class. 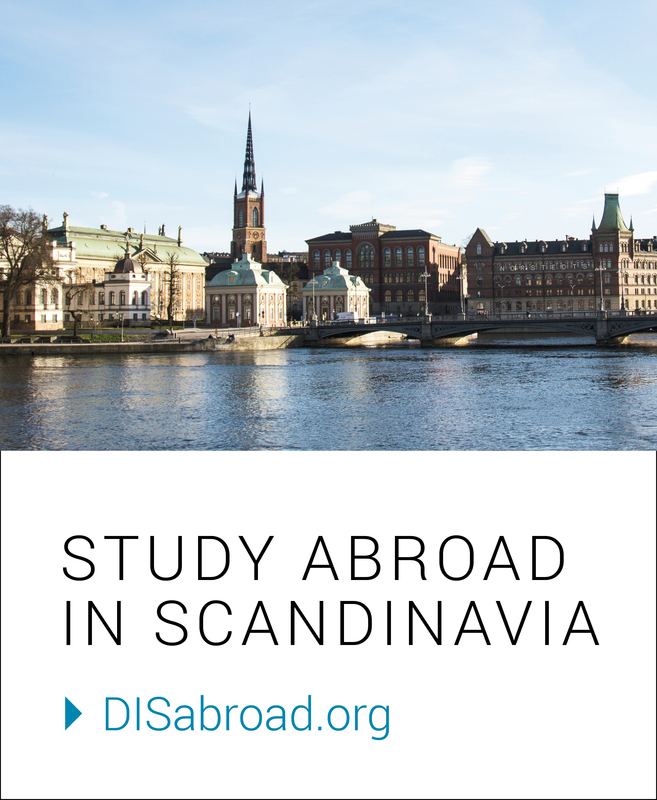 Once my classes finish at DIS, I may go explore some part of Stockholm with my classmates, such as Skansen, shops at T-Centralen, or a local café. In the evening, I commute back to Täby and join my hosts for dinner at home, where we talk about our days and have interesting conversations about Swedish and American culture, politics, science, food, movies, or other topics. After dinner, I usually join the family in playing card games or watching Netflix movies and eating candy on the couch. Once the kids are put to bed, I usually chat more with my host mom and work on school projects or homework for the week. DIS: What activities have you done together? MLF: We love to cook and bake together (I would consider this house to be a modern-day Willy Wonka’s factory!). We also love to watch movies and shows together, especially on the weekends. We’ll have Cozy Friday – which involves eating Mexican food, baked treats, candy, and watching movies or shows of our choice in the living room. I also like to attend my host siblings sport practices whenever I can, and when the weather is nice, we may go for a walk. Sometimes we go to the local mall and shop for American candy to try, accessories for their house (they’re currently renovating their rooms), or take an impromptu trip to Täby’s biggest candy store (which literally has hundreds of different types of candy). Sometimes, we may also play card or board games as a family before or after dinner. DIS: How has your Homestay experience been meaningful to your study abroad experience as a whole? MLF: Selecting a Homestay was one of the best decisions I made for my study abroad experience. I truly believe I was matched so well with my host mom (whom I consider to be my twin, 20 years apart) and her three amazing kids. Coming from a university where I lived in a residential dorm for the last two years, I knew I wanted the opportunity to have a home environment – where I could simply come back from school and talk about my day with my host family, watch television, share funny stories around the dinner table, and participate in extra activities, such as baking, watching movies, and going to sports practices. By living with Swedes, I have the opportunity to meet other family members and go to iconic places in Sweden, such as Grona Lund and IKEA. A Homestay has provided me the space to continue to develop my sense of independence (especially in a foreign country) and to reflect on my experience here in Stockholm. I have also been able to grasp a unique perspective on Swedish culture through interactions with my host family, as there is always a place for me to delve in great conversations at home. My love for my Homestay is certainly a huge part of my love for Stockholm itself, and I know that I’ll always have a second family and home to return to in the future. DIS: Do you have favorite Swedish expressions or traditions? Any that you think you will bring back home with you? MLF: Fika is certainly a tradition I will definitely bring back home with me, along with the many great dessert recipes I’ve learned from my host mom Lina. I love the fact that I can simply sit with family members and friends throughout the day and take a break to indulge in my favorite drink and food – coffee and desserts. I think it’s a great way to catch up with people. I will also likely bring back Cozy Fridays and Saturday Candies because they’re great ways to bring the family together in a relaxed atmosphere after a long week of work and school. These traditions are great bonding moments between my host family and me, and I believe they’ll be great bonding moments with my friends and family back at home.